Finely detailed filigree is the perfect embellishment for this stylish wedding reception card. 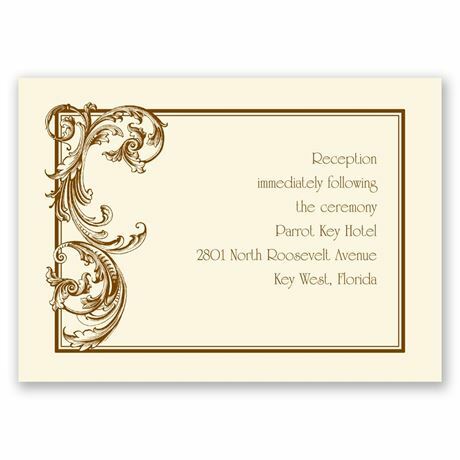 The filigree is printed in the same ink color you choose for your wording for a custom look. Your wording is printed in your choice of ink color and up to two lettering styles. This product features thermography printing. Thermography is a unique printing technique that results in raised lettering you can feel, which adds to the luxurious experience of this printed piece. It's a beautiful invite, my invite colors where one and when I received it they turn out to be another. The opinion of the color was there but..... When I got it was too dark. I called and the lady was very short and kinda rude!!! Quality okay but the service kinda killed the moment.